Podomatic > Help Articles > iTunes > How do I get listed in the iTunes Store podcast directory? How do I get listed in the iTunes Store podcast directory? 1. Before you begin, be sure that you have at least one episode published. Apple will reject an empty RSS feed. 2. Go to your My Podcast page. 3. In the Promotional Tools section, there is a field entitled RSS Feed (see diagram below). Copy the link in that field. Important: Do NOT copy your Podcast URL; iTunes will reject your submission if you submit your Podcast URL. 4. Go to the iTunes podcast submission page at https://podcastsconnect.apple.com and paste in your RSS Feed. 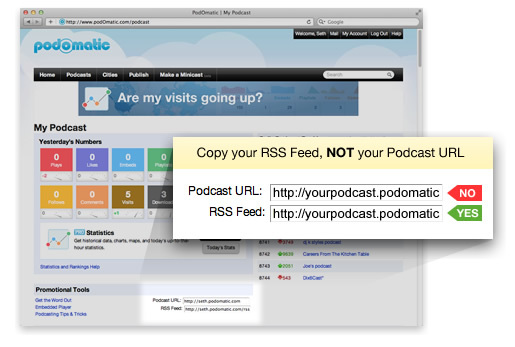 Once you submit your RSS Feed, Apple will review it and decide whether or not to list your podcast in the iTunes Store. This decision is made solely by Apple, so we can't guarantee that your podcast will be accepted. Their review process can take several days. Be sure to read through Apple's submission guidelines before submitting your feed. If your feed is rejected, you cannot resubmit the same RSS Feed URL, so be sure to follow the directions carefully.